Naming is overrated. As far as I know, the treats I'm about to reveal to you have no official moniker, but that doesn't stop them from being completely addictive and delicious. Nope, it doesn't slow them (or my intake of them) down at all. "What's in a name?" indeed. All it takes is one glance at the list of ingredients to know that this is some good candy. It has sweetness, it has crunch, it has saltiness, it has chewiness, and it melts in your mouth. I've found that the making of this candy can either be tedious or a fun challenge, depending on my attitude at the time. If you work quickly, the mess and overall difficulties are no big deal at all, especially considering the tasty end results. In a large bowl, combine the cereal and marshmallows. 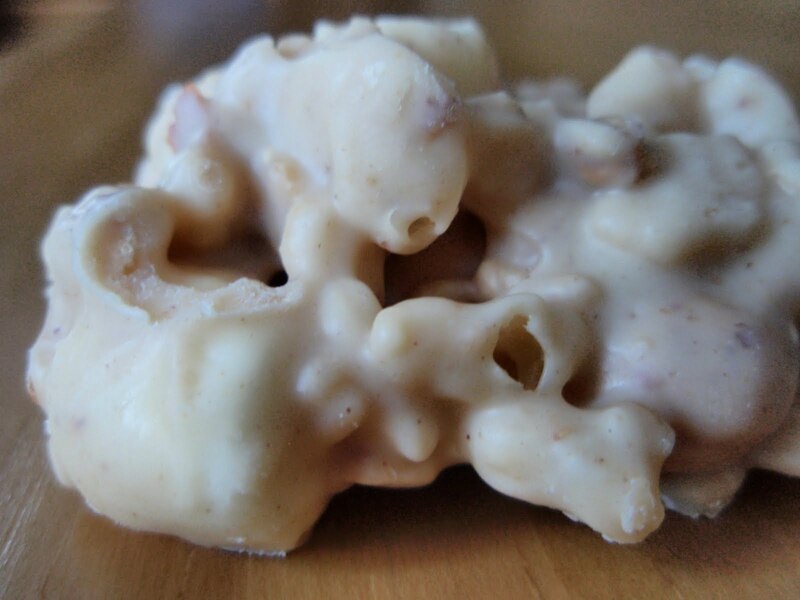 In a microwave-safe bowl, melt the white chocolate and peanut butter. Stir the oh-so-drinkable white chocolate-peanut butter mixture into the dry goods and drop by tablespoons onto waxed paper. Let them set until firm and then store in an airtight container. No need to have a name for this little treat! So delicious! beauty, normalality, intelligence and names are overrated. But i reckon this sweet would be fantastic! The milk chocolate versions is called Space cakes here because they look a bit like meteors. What's this? Krispy treats with chocolate and pb?? Wow, Grace. You've really created a gem here. Who cares what you call it? There isn't a kid of any age who won't love these. This sounds unusual and unusually "good", grace! I love PB and RCrispies in candy! Ok, this ingredient list includes four of my favorite things. How can this not be amazing? Must try. I've got antihero name for it. "I want"!! those look dangerous to keep in the house. open lid take 2 close lid, 5 minutes later, open lid take 3, close lid. 7 minutes later open lid take another 3.... LOL!! these definitely wouldn't last long in my house. they look so darn good! Grace this look absolutely delicious! !Love it! Sounds like the perfect name to me :) These look super addicting! That looks a piece of heaven to me! Like "Rice Krispie treats" but with chocolate! Delightful! Nope. Couldn't make this because I'd horde it all for MYSELF. Oooh, I bet this would be heaven in dark chocolate, too. That's so simple and easy! Yet looks fab! I am sure it must have made a great treat! I think I would call this "The Most Addictive Thing Ever". And then eat it all up. M,....What more can I say??? TASTY!! Que rico tiene que estar esto. You can't go wrong with that list of ingredients, sounds perfect! I just inherited a 1954 community cookbook from Douglas, Georgia, and it is jam packed with old school candy recipes. I can't wait until Christmas so I can start some serious holiday baking. What's the origin of these delicious looking treats? You're right. Who needs a name when a treat looks and tastes this delicious. This is my kind of candy. Short ingredient list, easy to make, and delicious to boot! I recently made something very similar, just w/chocolate chips too :) it's the avalanche bark at rocky mtn chocolate factory! My kids would LOVE this! Actually, so would I.
Oh my gosh! I want some! I bet they are delicious. I can see why with those ingredients. Hey I like Lorraine's comment, they could be Sothern Grace Chews! Great name for an awesome looking candy! A white chocolate peanut butter mixture does sound very drinkable! All my favorite things in one candy! This is the next item my children will become guinea pigs for.. I'm not a big fan of peanut butter, but I bet all that white chocolate can cancel out any of my doubts. YUM! God, these treats look delightful. They seem to be bite-sized too which would only mean trouble for me. Awesome. Good Gosh! You did not really have to post this. I want it right now. I love chocolate and peanut butter. Thanks for sharing...Oh goodness I want one right now!!! That candy would be called heaven in my book! These nameless goodies look sinfully addictive Grace...I'd love a bite right right now. OMG.....these have to be so delicious...If I had all the ingredients I would make them right now! Grace... just looking at the picture makes my mouth water, I can almost taste that sweet, white chocolate! Must give this one a try! Names are over rated indeed! Now these squares are my kind of treat!! and simple to boot! Sounds good to me. Sweet and salty is such a pleasing combination. They look pretty cool too! I love the sounds of this dessert, perfection! Those sound tasty. Good Candy is quite an appropriate name! But I am willing to accept that challenge. Oh yummmmmmers these sound so good to me right now! I am bookmarking this to make some time this summer with the kiddies! Thanks Grace! Hello to my new love! This is how I would like my Rice Krispie treats. Oh yum! I love pb and white chocolate combo, and yes..what is in a name? Yes - you are right. This does not need a name for me to eat it all!! I make these for my kids, but I use Almond Bark instead of white chocolate. I also add dry roasted peanuts and use chunky peanut butter. Yours sounds delicious! 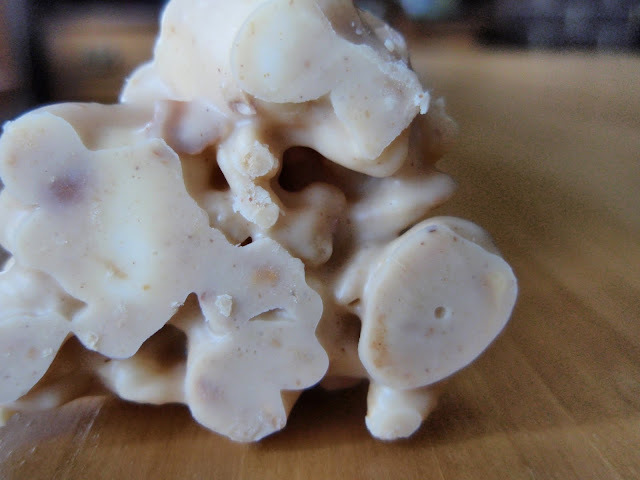 I would call it White Chocolate Peanut Butter Krispies~ can't wait to make them!